San Diego, CALIF.- Opposition to the Chargers efforts to build a downtown stadium continue. The following Editorial first appeared on the website La Prensa. 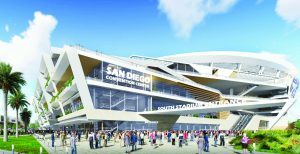 to be a final death blow to Proposition C.
After months of stalling on his decision to either support or oppose Proposition C, Faulconer this week declared his support for the measure that would approve a downtown stadium for the Chargers. Faulconer explained that he only agreed to support the ballot propositon after he negotiated several concessions from the Chargers that would ostensibly protect taxpayers. But the concessions Faulconer claims to have extracted from the Chargers not only amount to an unenforceable commitment, but could now expose Proposition C to legal challenge if it does pass on November 8th. For the complete Editorial that first appeared on October 6, 2016, follow the link.